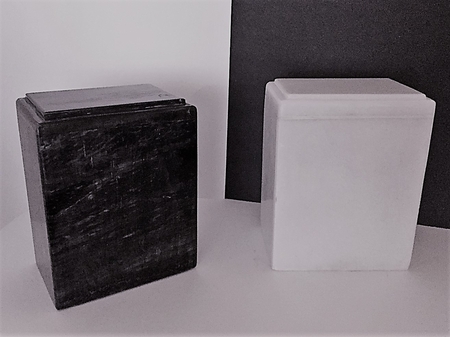 These beautiful niche size genuine marble cremation urns are SPECIALLY PRICED at $129 each and are available in gray/black or white marble. Each piece of marble has its own distinct characteristics with veining and splashes of gray, red and brown. It is beautiful, genuine marble and is typically found in columbariums and cemetaries throughout the US and Europe. This tasteful and discreet urn has a smaller stature so it will fit easily into most crematorium niches. It is one of a kind and is genuine marble. Pictured to the left is an example of how each marble urn has unique markings. No two are alike but all are beautiful and genuine. - EXTERIOR DIMENSIONS are 7" wide x 5" deep x 8.75" tall.